The cephalometric X-ray is a unique tool, which enables Dr. Banning to capture a complete radiographic image of the side of the face. Cephalometric X-rays are extraoral, meaning that no sensors are inserted inside the mouth. 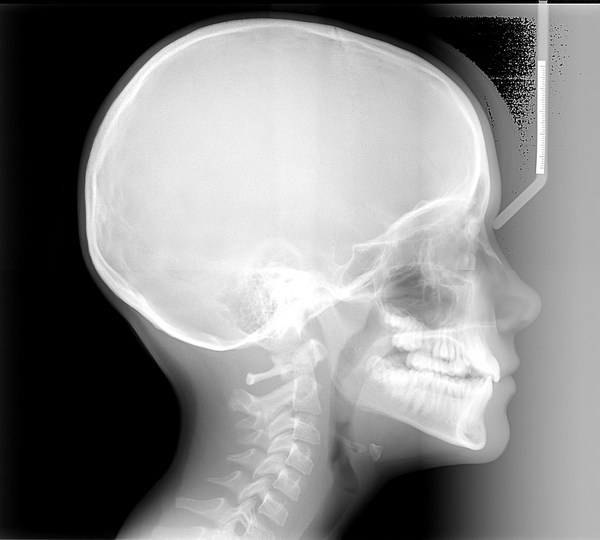 Cephalometric and panoramic X-rays display the nasal and sinus passages, which are missed by intraoral X-rays. Cephalometric X-rays are usually taken with a panoramic X-ray machine. The adapted machine will have a special cephalometric sensor mounted on a mechanical arm. An X-ray image receptor is exposed to ionizing radiation in order to provide pictures of the entire oral structure. The advantage of both cephalometric and panoramic X-rays is that the body is exposed to less radiation. How are digital cephalometric X-rays taken? After capturing cephalometric X-rays, Dr. Banning will be able to see a complete side profile of the head. This can assist in orthodontic planning, and allow an immediate evaluation of how braces might impact the facial profile and teeth. If you have any questions or concerns about cephalometric X-rays, please ask your Dr. Banning.